Toulemonde Bochart combines the traditional skills and work on beautiful materials. In creative design carpets, Toulemonde Bochart brings contemporary interiors, classic or avant-garde, a style of modernity beyond the influences of fashion and a high comfort of sustainable range. Toulemonde Bochart There are 28 products. More understated in structure and tone than the Baya, Raja rug, in the traditional colours of Rajasthani fabrics, nevertheless brings the finesse of its motifs to the fore. Its effect is one of getting away from it all, at the same time harking back to tradition. 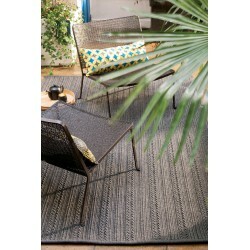 This hand knotted rug reveals shades and reflections of the subtly dyed jute, a natural fiber. 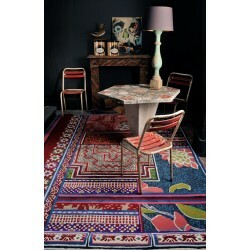 The depth of the colors in all shades is enhanced by the contrasted pattern inspired by weavings of the Atlas.